Watch Anya Kamenetz on the ‘Debt Generation’ on PBS. See more from Need to Know. My parents are currently paying for my education because I can no longer afford it and I am about to have too many credits… financial aid cutoff is 180 credit hours. I transferred in with two degrees, I am continuing with only one. I now feel like the appeal letter I need to send in with my appeal form to financial aid has to be worded like an apology. I need to apologize for going to school? I am not sure what I am going to do about next semester if I do not receive financial aid. 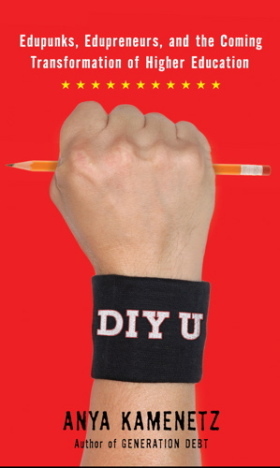 Seeing DIY U has filled my head with ideas and a new dream because I may not receive the degree I need for the job I desire… I want to help work towards making education… with an attainable degree… free. Come to the Virtual Book Party for Learning, Freedom and the Web!